To make the hair for the child puppet I cut lengths of wool and pulled each length apart to make three strands. 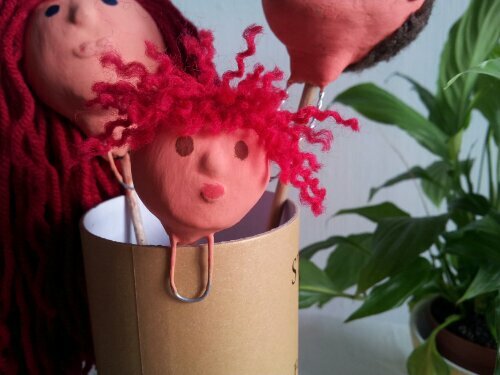 This method created a head of red curls. 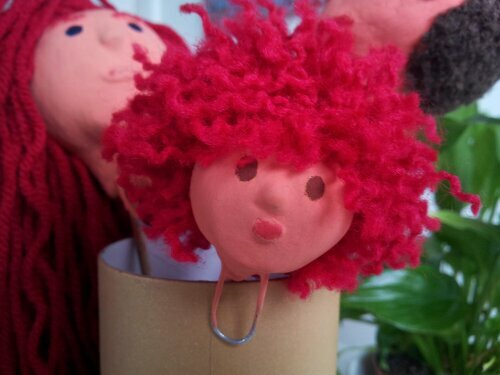 The child puppet has brown eyes and curly hair, like her father and colouring (complexion and red hair) like her mother. As I stuck each strand of wool to her head I contemplated her character. 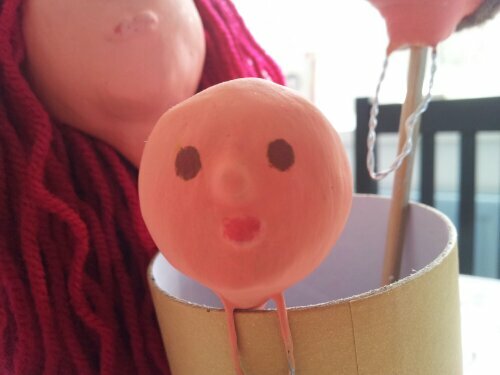 She has no ears, which I think will have an effect on the story. She will not have an awareness of the noise she creates and this could have a profound effect on her father, a soldier who has returned from a tour of duty with Post Traumatic Stress Syndrome. Irene Kacandes uses the idea of “narrative witnessing” to dissect Gertrud Kolmar’s The Jewish Mother. The essay appears in Acts of Memory, cultural recall in the present, edited by Mieke Bal, Jonathan Crewe, and Leo Spitzer (1999, University Press of New England, Hannover, USA). What particularly stands out in this essay is the idea of relieving “traumatic symptoms like flashbacks, reenactments, amnesia, and numbing (among others grouped under the medical diagnosis Post-Traumatic Stress Disorder, or PTSD)” by creating “some kind of coherent narrative about the event or events that inflicted the trauma” (Kacandes, 1999: 55). This is explored further by examining the different ways two characters in Kolmar’s text react to a man exposing himself to them; one of them verbalises what she thinks of him; the other says nothing. Kacandes makes the connection between verbalising and healing; the one who said nothing was not able to process the event and let go of it (1999: 59). My own experience of PTSD suggests this idea has a truth in it, although the character who verbalised the event seemed to be naming her idea of the man who exposed himself rather than stating what had just happened. That this man had revealed more of his character than what he appeared to be, combined with declaring his actions inappropriate, was the basis of her verbalisation. With this in mind, it would be appropriate for my film to come to a point where the leading character recognises her uncle’s actions as inappropriate, and allows herself to begin healing. This article looks at the work of scientists involved in creating techniques for forgetting memories. They believe it might be useful for people experiencing post traumatic stress disorder. I wonder about the truth of that; surely PTSD occurs because a person has tried to forget painful events. I wonder how forgetting and suppressing are different. Perhaps suppressing causes PTSD and forgetting allows the memory but loses the bad feeling?